With summer drawing to a close and students preparing to return to or begin their student life we wanted to show you one of our favourite social media moments from summer 2015. This video, which surely takes inspiration from Jimmy Kimmel’s ‘Mean Tweets’ video series hails from Keele University and if feature lecturers from the university read funny and uplifting posts that students have shared on Yik Yak about the university. 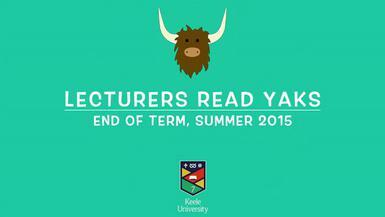 We have blogged in the past about how Yik Yak could be harnessed by universities and colleges to share meaningful content to a targeted geographic audience. Yik Yak has earned a reputation as being a refuge for unsavoury commentators despite this however this video by Keele shows that it’s powers can be used for good too. With Yik Yak, it’s really about balance for every shudder inducing post there’s 10 posts that will restore your faith in your student population! Watch it and just try not to smile!